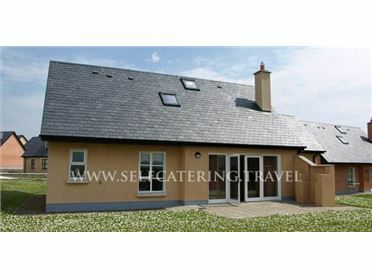 Gort Lodge is a spacious, detached cottage situated within the town of Portmagee, County Kerry. Boasting three bedrooms, two double (one with en-suite) and one twin, as well as a family bathroom; this property can sleep up to six people. The cottage also contains an open plan kitchen and dining area, along with a sitting room hosting a wood burning stove. To the outside, lies a gravelled patio area with furniture, and surrounding views. Located amongst attractive countryside, Gort Lodge is a delightful cottage in a heart-warming part of Ireland. Portmagee is a delightful fishing village situated on the south western most tip of the Iveragh Peninsula in County Kerry, Ireland. Known as the gateway to Valentia Island, this town offers pubs, restaurants and Irish dancing, which takes place twice a week all year round. The famous Skellig Island Boat Trips are only two minutes from the village, while the area also offers great walking on the Kerry Way, excellent scenery and great cycling routes. Oil central heating with woodburning stove. Electric oven and hob, microwave, washer/dryer, TV with Freesat. Fuel, power and starter pack for stove inc. in rent. Bed linen and towels inc. in rent. Off road parking for 3 cars. Garden with gravelled patio and furniture. Sorry, no pets and no smoking. Shop and pub 1 mile..